"The first English Bible translated from the original languages"
William Tyndale believed the Bible should be available in the vernacular--the common people's speech. He famously declared, "The boy that driveth the plough shall know more of the Scripture than an educated man]." 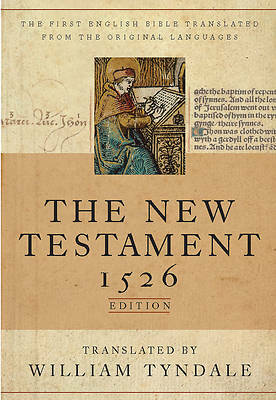 Though forbidden by the Church to translate the New Testament into English, Tyndale's determination resulted in its finally being printed in Germany in 1526. Smuggled into England, the Tyndale New Testament was a monumental success. The simple, direct language of many of its verses has resonated down the centuries. William Tyndale's legacy stems from his having translated the Scriptures in a way that made the most of the emerging English tongue. Bible collectors and anyone interested in the history of the English Bible will treasure this unique volume.